Brazil striker Neymar says he cried for two days after breaking a metatarsal bone in his right foot in late January. The Paris St-Germain star is out until April, having sustained the problem in a French Cup game against Strasbourg. 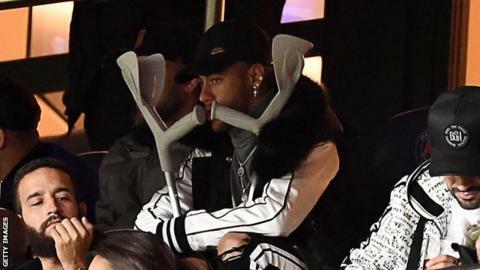 It is the same injury he suffered in February last year which put his World Cup in doubt, but this new blow "is more complicated", Neymar said. Last year, Neymar was out for three months after surgery, returning just in time to play in the World Cup where he scored twice in Brazil's run to the quarter-finals. This time, PSG's medical staff have decided on conservative treatment of the fracture rather than another operation. PSG said that Neymar will be out for around 10 weeks, meaning he will miss their Champions League last-16 tie against Manchester United, which the French side lead 2-0 after last week's first leg at Old Trafford. The second leg is in Paris on 6 March.